I've spent more time than I should probably admit thinking of ways to store my makeup. I suppose as someone that has a love for both organising things and beauty products...well it was bound to happen. Makeup collection posts and Youtube videos are some of my favourites, not only do they satisfy my nosey blogger inquisitiveness but also give me ideas of the best ways to store my own stuff. 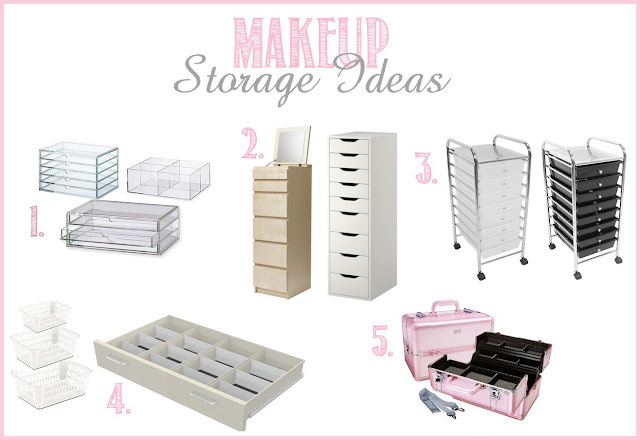 If you haven't spent quite as long looking into the topic as I have, but want a quick round up of some of the most popular beauty storage solutions- here they are! I love the modern and clean look of clear acrylic, the mini sized drawers are perfect for splitting your collection into different categories. What makes muji storage such a winner is that individual drawer and divider units can be stacked together and added to- this means you can always add to them if your collection grows. There's loads of different variations too from wide drawers to narrow drawers, and various different shapes and sizes of boxes that you can have with or without lids. John Lewis do a stackable jewellery storage range similar to this which I think is a great idea, I have so many accessories and as with my makeup I'm always wondering how to store them. The same concept as the Ikea drawers, the tall unit takes up hardly any floor space and the fact that theres a lot of drawers means things can easily be categorised. They're less expensive and more mobile than solid furniture, so are ideal if you want to store everything away in a cupboard and then wheel it out into your room when you're getting ready. While they lack the sturdiness of fixed furniture, if you need something that can easily be stored away or moved around this is the perfect thing for the job. This is how I'm currently storing my makeup, I have a set of five wide drawers in my bedroom which are dedicated to my beauty stuff. Each drawer is categorised by theme (face, lips, eyes, nails, skincare) and then each drawer is split into different sections depending on the product. For example the face drawer is split into: foundations/ bb creams, blushes, bronzers, highlighters, concealers, powders and primers. I use mini white baskets in some drawers, and ikea drawer dividers in others. The good thing about this is that you can use furniture you already have in your bedroom; previously I was using these drawers to store things like spare bedding and basics like leggings and vest tops, which were easily moved to a different set of drawers. Typically what professional makeup artists use to carry their kit around, but the fact that they're designed to hold makeup makes them quite handy just for storing products at home too. If you have a smaller collection and want something compact that will keep your makeup protected I think this is a good option. Thank you sooooo much for this post!!! I have makeup coming out of my ears and have spent the last week online looking for storage ideas and haven't really found any good ones. A train case just isn't cutting it now. I'm going to start looking for a plastic storage trolley asap! I can roll it into my closet when I don't need it, I like that. Great post! Fab post I just bought the malm dresser so next on my list is the Alex or malm drawers, such great value for money! I love those Mujhi draws . just got them last week :) they are awesome !! I need to do something about my makeup storage BAD. Right now I'm using one of those Rubbermaid things. I mean, it does the job because there's separate drawers but it's uglier than sin. My makeup is currently in its travel bag still because I've just moved. It'll probably stay there and under the that room sink until January when I move again so for now its safe and I know where I can find it if need be. I have an IKEA Helmer to store my nail polish (not full but almost there), and the majority of my makeup fits in my Lori Greiner Deluxe Wood Cosmetic Box. I also keep some of my liner and lip gloss in various makeup bags. What a great post! I am in desparate need of organizing my makeup. It's such a mess right now. These are fabulous ideas!! I can't say I have ever written a review for a storage place before, but hey there is a first time for everything and these people are really good! They are the only place I visited that took the time to show me my options and did not try and force me into a larger unit.